About 20 participants enjoyed a cool and overcast (but dry) morning at Boundary Bay Regional Park on the quarterly Delta Nats Casual Birds-on-the-Bay outing. Hi-lites were the Brant Geese, a brilliant Hooded Merganser, some almost-interesting chatter, and a delicious gourmet lunch including home-made scones and cookies made by the Delta Nats Ladies (Thanks Jennifer, Eleanor and Rochelle). Terry’s beautiful photos of this outing are on our DNCB Picasa site at: http://picasaweb.google.com/dncbirding. 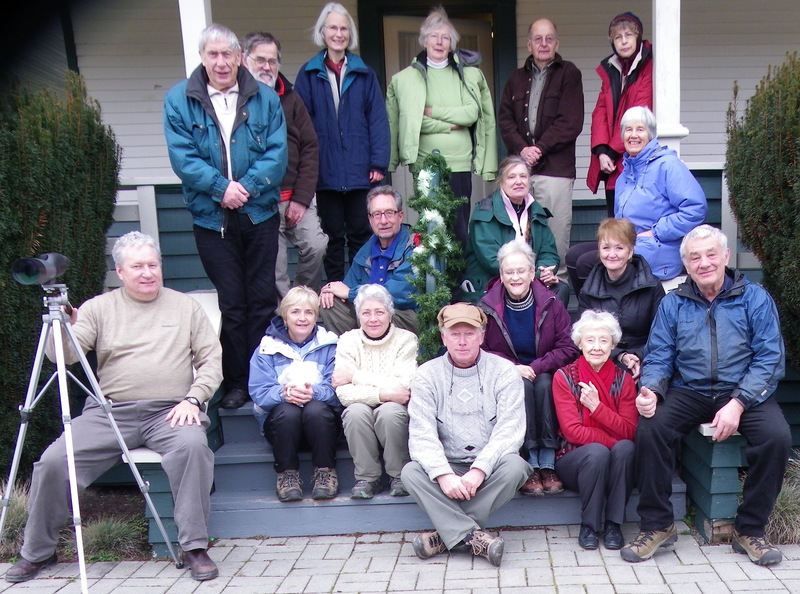 We left historic Cammidge House at 9:00 a.m. to walk toward Centennial Beach. The ditch was frozen so no ducks there, and the bushes were quiet too, except for a Red-tailed Hawk, probably one of the BBRP residents. In the unfrozen part of the Beach pond were Mallards, Northern Shovelers and American Wigeon (but no Eurasian seen there today, but a couple seen later in the Bay). The tide was very high so no shoreline was available for Shorebirds to feed on. We saw a couple of small flocks of Dunlin and Black-bellied Plovers fly past, and higher up were V’s of Snow Geese. A raft of Greater Scaup was quite close to shore, while Surf and White-winged Scoter were further out. A Horned Grebe was diving in front of us. In the “new spit” closer to 12th Avenue, there were large flocks of Green-winged Teal, Northern Pintail, Canada Geese and I guess around a hundred Brant Geese (we did not spot any leg bands). Bald Eagles would occasionally fly by arousing the waterfowl. Northern Harriers flew by too, but they did not faze the ducks. A gorgeous male Hooded Merganser posed for us in the pond by the pump station. From the Lookout we saw a few Sanderlings foraging in the mud. On our walk back through the interior of the Park, we saw lots of Sparrows, mostly Golden-crowned, Song and Fox. Anne’s sub-group saw some Purple Finches. We saw lots of other “regular stuff” (e.g. Towhees, Robins, Juncos, etc. ), but were blanked on our/my target birds (e.g. Northern Shrike, Western Meadowlark and even Wrens; Marsh, Bewick’s or Pacific). I was hoping we might see a Warbler too, but didn’t. Our eagle-eye and “suspect birder” Roger spotted a Snowy Owl across the Bay at 72nd Street as well as his uncle skiing on Grouse Mountain 30 miles away. Anyhow, it was a very pleasant morning, with some nice new folk, several of whom wolfed down the Delta Nats Ladies’ goodies as if they had missed the Sally Ann breadline. Roger took the mandatory Group Photo on the CH steps. Check it out, along with previous reports (including last Monday’s which I had difficulty sending) on our DNCB Blog at: https://dncb.wordpress.com/. Don’t forget the Christmas Bird Counts; Vancouver’s on Dec. 18, our Ladner CBC on Tuesday, Dec. 27 and the White Rock/Surrey CBC on January 2. Next DNCB outing is Monday, December 19 leaving Petra’s at 8:00 a.m. Again, comments welcome, and let me know if you want off this list. This entry was posted in *DNCB, BBRP, Birds-on-the-Bay, Cammidge House. Bookmark the permalink.